A group of Aberdeenshire residents say the construction of the AWPR has resulted in traffic streaming "right past their front doors" at all hours and shattered the peace in their once-quiet community. Motorists took to the AWPR for the first time yesterday, marking the beginning of the end to a 70-year wait for a congestion-busting city bypass. Plans for a major event are being drawn up to mark the official opening of the Aberdeen Western Peripheral Route when the road is finally completed. Economy Secretary Keith Brown has hinted that the Scottish Government would consider splashing the cash to try to speed-up the delay-hit Aberdeen bypass. Transport chiefs have officially pushed back the completion date for Aberdeen’s long-awaited bypass – revealing the road is not now due to be open until late autumn. The delay-hit Aberdeen bypass was at the centre of a fresh controversy yesterday amid claims that workers had to pay to receive their wages. Transport chiefs were under fire last night after it was finally confirmed that Aberdeen’s long-awaited bypass would not be completed on time this spring. Transport chiefs have signalled that preparatory work is “progressing well” on a scheme to finally ease congestion at Aberdeen’s notorious Haudagain roundabout. Archaeologists have been left stunned after unearthing new evidence of Roman army activity in the north-east and an “unprecedented” collection of ancient artefacts and structures dating back to 13,000BC. Scottish ministers have been urged to travel to the north-east “as a matter of urgency” to reassure local workers from collapsed construction giant Carillion. More than 800 jobs across the UK have now been axed at collapsed construction giant Carillion – including workers building Aberdeen’s long-awaited western bypass. Workers on Aberdeen’s long-awaited western bypass were left “dazed and confused” last night amid reports that several had been made redundant. Economy Secretary Keith Brown has revealed that sections of Aberdeen’s new bypass could be opened earlier than planned – but he was unable to confirm whether the full road would be completed on schedule. Economy minister Keith Brown will be grilled on the progress of the AWPR later today. The Scottish Government has raised hopes that there will be no further delay to the completion of Aberdeen’s bypass following the collapse of Carillion – and that 260 affected jobs could be saved. Scottish ministers were last night under pressure to take “decisive action” to ensure Aberdeen’s £745million bypass is not derailed by the collapse of a key contractor. Hard-working bypass construction staff have been told they will be landed with covering their own costs of accommodation, just days before Christmas. A road connected to the Aberdeen bypass scheme will be temporarily closed from today. A land-owning couple, whose farm has been cut in half by the Aberdeen bypass, have been visited by the senior government minister heading up the project. Under-pressure roads bosses have stepped up health and safety restrictions at the Aberdeen Bypass following a spate of high-profile accidents at the site. Transport Scotland has insisted the completion of work on the £745million Aberdeen city bypass road is not in any danger despite turmoil at one of the project’s consortium partners. Troubled Aberdeen city bypass partner Carillion has drafted in help to carry out a review of the business as it continues to reel from a collapse in its share price. Advance works on the Haudagain bypass project could move forward ahead of the completion of the Aberdeen Western Peripheral Route, according to a national transport body. Thieves have stolen thousands of pounds worth of building tools from an Aberdeen bypass site. A landowning couple whose farm is being split in two by the Aberdeen bypass claim they are not being given a fair deal by the Scottish Government. A team of Polish workers on the Aberdeen bypass has been left enraged after their weekly pay was held up in the run up to the Easter weekend. This is the heart-stopping moment a teenage climber dangled more than a hundred feet above ground from a crane being used in the construction of the Aberdeen Western Peripheral Route (AWPR). 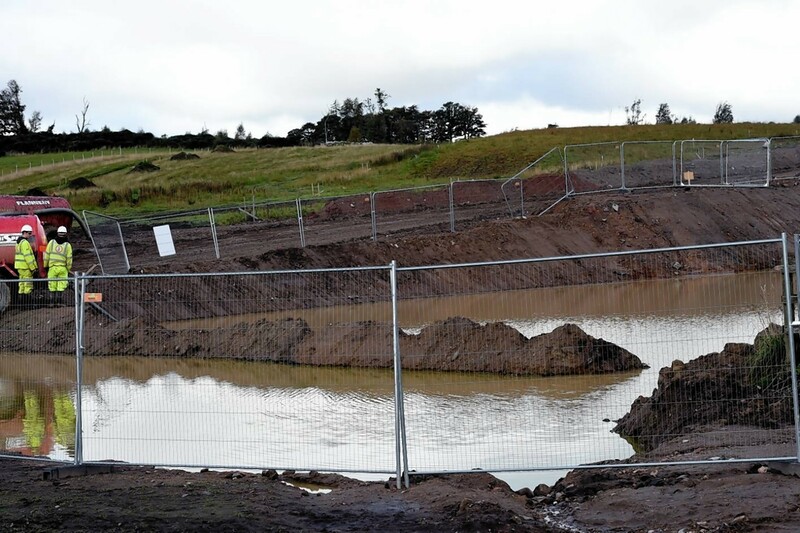 More than 100 workers have been injured during the construction of the north-east's long-awaited £745million bypass. An Aberdeen Western Peripheral Route worker was banned from the road yesterday after being caught driving a vehicle at more than three times over the legal alcohol limit.